Here's the official schedule of the 2018 Supreme Dairy Show. You can also refer to our Schedule section for all the details. 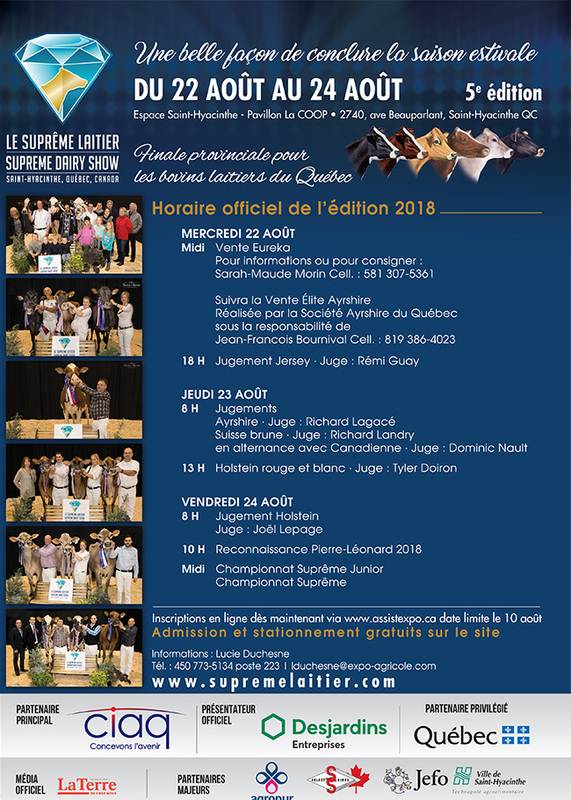 The 5th edition of the Supreme Dairy Show will be held Wednesday, August 22 (evening) until Friday, August 24, 2018 in Saint-Hyacinthe. 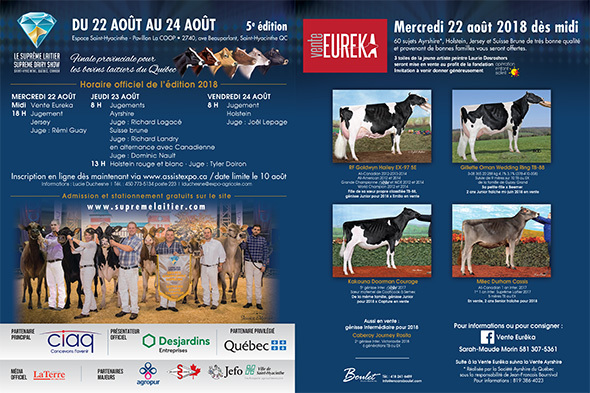 Dairy cattle breeders will be invited to present their most beautiful subjects, which will host the Quebec Provincials of Dairy Bovine Finals. Listening to the breeders, exhibitors and partners, the members of the Board of Directors of the Supreme Dairy Show took the important decision to anticipate the dates of the event. Following numerous discussions with the people involved in the community, this change aims to optimize this event and promote the marketing opportunities of elite subjects. In addition to judgments, the trade show component, networking activities and conferences will be redesigned to provide excellent visibility and a meeting place for all partners in the industry. An improved formula offering flexibility and accessibility will be offered. The Supreme Dairy Show is evolving and will now be a great late summer exhibition. This contest of choice will set the stage for fall events. This change will allow the Supreme Dairy Show to continue its mission and thus remain an international event and a must for all dairy producers. The event aims to create trade and business opportunities for all dairy stakeholders including dairy producers, cattle producers, traders and dairy industry stakeholders . 146 days until Suprême laitier. Check out the results of the previous editions.